On a ship there are many parameters that needs to be controlled or monitored including: temperatures, pressure, level, viscosity, flow control, position of vessel, speed, torque control, voltage, current, machinery status (on/ off), and equipment status (open/ closed). 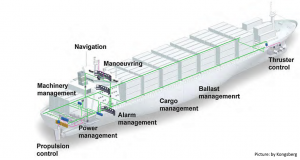 As the market is driving ship owners to become more efficient with reduced staff on board it called for an automatic control and monitoring system for the ship that enabled unattended operation of machinery spaces. Vessels capable of safe operation at any period of time qualify as UMS (Unattended Machinery Space) ships. A modern automation and control system is a fully integrated systems covering many aspects of the ship operation that includes the propulsion plant operation, power management operation on the auxiliary engines, auxiliary machinery operation, cargo on-and-off-loading operation, navigation and administration of maintenance and purchasing of spares. Monitoring and control of the ships propulsion and power is essential for its efficiency and safety and there are many systems and parameters to consider like: fuel consumption, combustion temperature, engine temperature, diesel engine safety and start/stop, generator voltage and frequency control, generator load in KW and %, load control, torque, heavy consumers logic, control of diesel electric propulsion, thrusters monitoring and control etc..
Auxiliary machinery monitoring and control covers several systems like: main sea & fresh water cooling system – pumps, system pressure, temp. etc., Potable and fresh water control, Air compressors, Bilge & sludge control – Tank level, pumps, Fuel oil system – Tank levels, temp., viscosity, flow, purifiers, heaters etc., Other cooling systems, Boiler/steam system – pumps, valves, pressure temp. etc., Air Conditioning, ballast water treatment, exhaust gas treatment equipment. For safe on and off loading of cargo, especially on tankers, this process is closely monitored and many times incorporates functions like: Level gauging, Control of cargo pumps, Valve control, Ballast & ballast pump control, Heeling control, Remote monitoring of temperature, pressure, and flow. 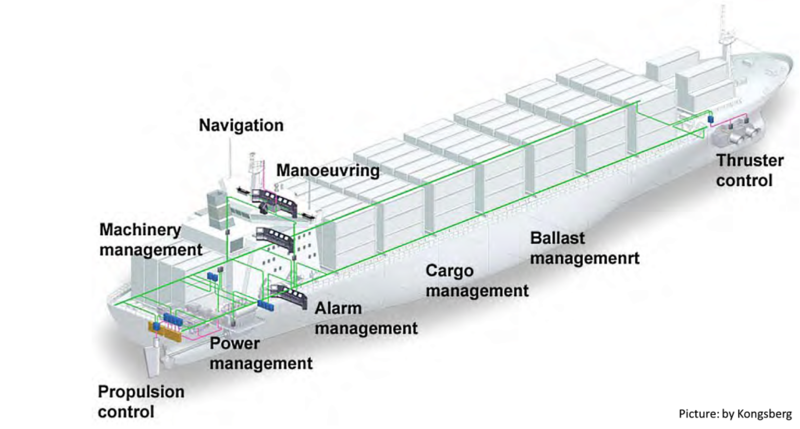 In order to further improve the ships efficiency many equipment manufacturers are looking into feeding the main control and monitoring system with opportunities for condition based monitoring. This would further improve the possibilities of preventing breakdowns on board.